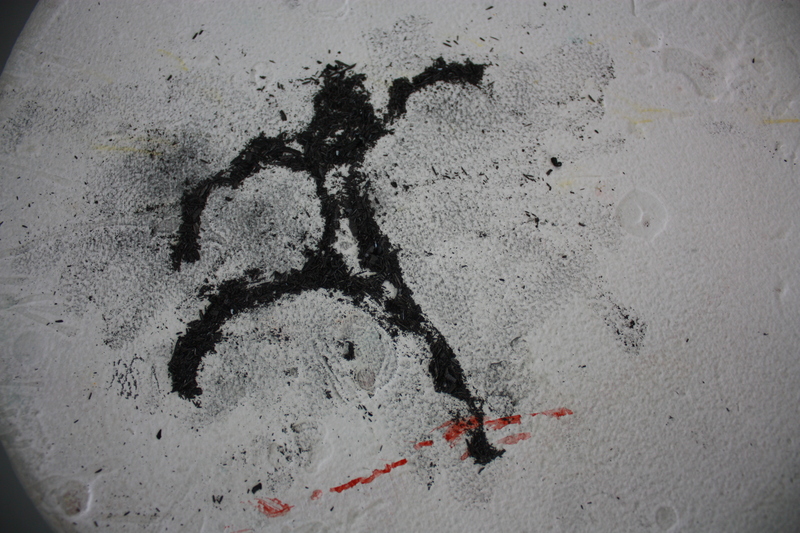 Drawing made from pencil shavings on my studio stool, courtesy Catherine Haley Epstein. Culture is a collection. It is conditions. It is conditional. By definition it requires humanity as an ingredient. So if human intellectual achievement regarded collectively is missing humanity, can we really call it culture? Like the verb to culture, a strong and successful culture is one where you make conditions suitable for growth. By definition it might get dirty in there. If current culture is a collection of hermetic, aseptic and empty “achievements”, I’m guessing this is not a suitable environment for growth. Much like the hands we feverishly wash with antiseptic lotions to relieve ourselves of germs – the cultural achievements are similarly stripping themselves of the messy side of the arts, in favor for a focus on the audience and the funding. It’s a recipe for disaster really. Historically intellectuals piss on each other and argue, not really so these days**. There is a level of sneering – sneering at the spiritual aspects of art, sneering at the unembellished artist or the simple and humble act of making art. They sneer because they don’t want to be involved in the mess of an argument. They stay on top of the mess by making up stories about art and theories on art. These intellectuals and their theories are part of the same system that participates in the conversation of the mediocre art devoid of humanity: they continue making up theories to promote the weak forms of art, frankly because the spirituality of art and all of its incredible merits are not allowed in academe or “intellectual” discussion. So the books will keep getting published on the anti-bacterial notions of art, and they will keep heralding the mediocre artists or the small handful of artists who have won stamps of approval in the past 50 years or so. Then there are the critics who write about arts and carry on about collectors and people who pay money for art. Why are they wasting their time? This would be like asking a Wall Street Journal writer who covers money market funds to write a piece about the use of corn flour in fast food restaurants. Related? In a small way related to the commodities market, but not really, and a terrible waste of said reporter’s time. So art writers please go take a bath and relax – keep writing about ART. There will always be people with more money than you, artist or otherwise, that’s not what we should care about when looking at a painting by Anslem Keifer, an installation by Rosemarie Trockel or a performance by Maguy Marin. We care about what you have to say vis a vis the art and why art is important. Make life confusing by talking about why art should be in schools, and the spiritual elements in art – money just isn’t important to this equation, so stop bringing it into the conversation. And lastly do not make fun of people queuing up to see art shows – people are starving for good art, they are starving for spiritual moments in experiencing art (visual, musical or otherwise), so don’t accuse them of being ridiculous and simply wanting selfies with the art. The selfie is the proof of the moment, and moments of color and depth that pitch ourselves out of the usual are missing these days. And artists, for the love of Pete, please stop thinking you are an island unto yourself – you have people in history you share a lineage with. You are not reinventing the wheel. And while your obsession may reveal genius, it will only be revealed if you get to work. Off with your ego, and on with the history and lineage which you should be participating in. You are simply a vehicle. And you are always loved. And don’t confuse nostalgia with history. Everyone seems to be allergic to “nostalgia” it’s one of the words that the nonconformist set can’t stand, along with “bourgeois”. Artists today are more bourgeois than ever – most definitely concerned with the material – obsessing over costs of paintings, money, galleries and collecting. I would recommend inserting some nostalgia to be reminded of the brave and new worlds artists historically encountered. Instead artists keep their hands clean with digital finishes to their work, like our leaders using drones to have an antiseptic war. May I recommend getting your hands dirty? Look into the eye of your enemy and have at it? ** Nice commentary from this past summer by Noam Chomsky deflating these exact “intellectuals” which I am referring to. Love it.